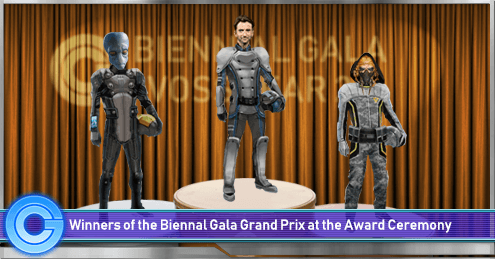 For six days, from Day 55, Voss thronged with visiting heads of state, industry tycoons, and high society as the Tionese capital played host to the Galactic Concordiate's first Biennial Gala. The Gala was organised to officially welcome the Falleen Federation and Sienar Conglomerate into the bloc, but as King Jado Dur`rik noted in an opening address, the celebrations held a greater significance. "We Falleen have not forgotten the lessons of our history: our unity is our strength. When my Council looked towards the Concordiate, we saw the possibilities which its renewed purpose could open not only to us, but to others." Explaining that "the principle which now unites us is a positive one; we have, as the Second Treaty of Forsetti declares, joined together 'to further the goals of peace, neutrality, and, prosperity.' Not by war or the promise of technology, but through our commitment to ensuring the galaxy becomes that which it ought to be, where intimidation and threats of force are subjected to diplomacy and law." Concordiate members were not alone in their celebrations, either. 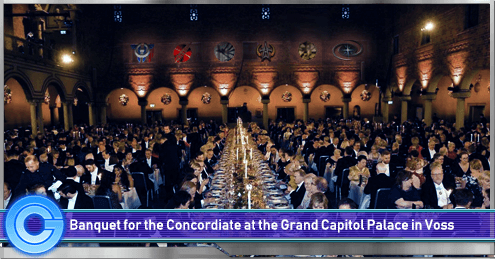 Government officials and business leaders from the Hapes Consortium, the New Republic, The Wraiths, Czerka Corporation, and the CIS were also seen at many of the Gala's different events. The ubiquitous presence of non-Concordiate members was explained by the Lady Hegemon Stephanie Barefoot-Delcroix, leader of the Tion Hegemony, who said the Concordiate's leaders "were keenly aware of the wider diplomatic opportunities presented almost as soon as discussions began on hosting an event like this." Stressing that although the "Executive Council made the decision early on to limit the number of guests, we wanted to demonstrate and celebrate the possibilities open to those willing to share our values and ideals." The dinners, balls, and receptions which filled the Grand Capitol Palace underscored the strenuous efforts that had gone into remaking the alliance. Even though the heads of state of the Condordiate's members have been meeting regularly for years now, this was the first gathering for its entire citizenry. When asked 'Why now?' the Lady Hegemon was poised to answer, "To us leading this alliance, one of its greatest failings has been a seeming irrelevance to the daily lives of its citizens. We have sought to change that: in virtually every corner of the alliance a public holiday was declared, and the number of journeys made to Voss has been extraordinary." Adding "By bringing our people together, we can better show them why we think the Concordiate matters and the opportunities it provides." Events were run throughout the districts of Meeshae, the capital city. Citizens of the alliance, and those invited as friends, were treated to scavenger hunts, local lotteries, and even a system-wide grand prix, in which the finest pilots from across the group traversed a complex course, testing their coordination and pushing their endurance to its limits. Tion pilots Athrun Zala and Dillininioh Colk took first and third place, while Garas Tegra, a Trade Federation pilot, took second. The Gala was brought to a close, on Day 60, when the Executive Council met for a joint press conference at the Capitol Palace broadcasted across the alliance. Viceroy Jacob Jansen, the current Magistrate of the Executive Council, gave the final address. "When we began discussing the Concordiate's future a year ago, it was apparent to us immediately the scale of what we are trying to achieve. But, in the months since, the alliance has come together dramatically. With each new act, we are slowly pushing the frontier of what was thought possible." Reiterating the group's founding principle, the Viceroy concluded "A space for peaceful diplomacy and economic co-operation is being created: we welcome Sienar and the Falleen to our alliance on that basis, and we stand ready to welcome any others who desire to do so." As nightfall drew in over the skies of Taanab, only the whistling of fireworks could be heard above the revelry of crowds below, where at the Trade Federation Palace, just a few hours earlier, representatives of the Galactic Concordiate had met to finalize the treaty which would admit two new members to the group: the Falleen Federation and the Sienar Conglomerate. It was widely hoped that the recent shakeup of the bloc would renew interest in its ability to act as a guarantor of stability and peace, and kindle an era of closer cooperation amongst neutral powers..
King Dur`rik, in a speech to the Sejm, set out his government's position on membership of the Concordiate: "Our Charter of Confederation states that 'we join together as brothers and sisters, accepting equally those Falleen lost among the stars and those others desirous of freedom and peace, in a firm league of friendship with each other for common defense, the security of our liberties, and our mutual and general welfare.' Although it has been six years since we declared neutrality, I have been determined always that our Federation should uphold those values as a model; that it should not be an island unto itself. With the Second Treaty of Forsetti, the Galactic Concordiate has demonstrated its commitment, not only to those ideals which we cherish, but a willingness , too, to argue that neutrality is not merely to stand by, as the passive observer, it is to develop our societies on our own terms, and in a spirit of cooperation with others across the galaxy." The Falleen Federation's admission to the group was therefore considered a major success of the alliance's reforms. The parallel application of Sienar was, however, considered a surprise, given the Conglomerate's history of independent neutrality. "Sienar has always been an independent and neutral corporation," noted Bart Roberts, Vice President of the Sienar Conglomerate Board of Directors, speaking on behalf of the Conglomerate. "It has been a guiding principle since our inception fifteen years ago, and shall always be so. Nevertheless, we have wanted to be a part of building a peaceful galaxy for some time now. But, it was never clear how exactly a corporation such as ours would 'fit in' with the Galactic Concordiate as it was first organized. As a non-government, we were simply ineligible to join the group's upper leadership. Now that full equality to all members has been granted, we are confident of our place and role in the group. And while we accept that the Concordiate is not a perfect solution to the problems that plague our Galaxy, we believe that it has the best chance of making a reality of the vision for an organized group of neutral governments and corporations based upon the rule of law, and respect for the sovereignty of its members." Concluding the press conference which followed the signing, current Magistrate of the Concordiate, Jacob Jansen, explained why the Galactic Concordiate appeared to stress the importance of collective action only now, six years after its creation. "When we founded the Concordiate it was conceived as a way to organise the existing relationship between its founders. We did not envisage it as a political 'project' of any kind; there was no need to. However, as Lady Hegemon Stephanie Barefoot expressed clearly two months ago, the galaxy has changed drastically since then. Lawless groups have emerged and targeted those of the galaxy willing to operate by the norms of civil diplomacy. Ignoring the problem has seen it grow, and further inaction will simply continue to undermine the role which peaceful diplomacy and mutual cooperation play in building the sustainable peace and prosperity the alliance has enjoyed. If the Concordiate seems now to be a 'project' then it is because we think that one is necessary." The Magistrate underscored the importance of self-restraint, which major powers would need to exercise if such a project was to be achieved. "Groups like the Trade Federation must lead by example. We have to accept certain limitations on our role and power within the alliance if our partners' voices are to be adequately heard and considered. 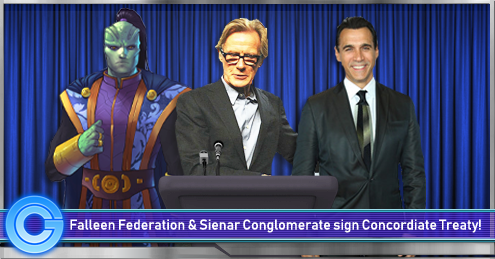 The Concordiate has striven to achieve that balance with its new treaty, and the results are reflected today with the signing of two members varying significantly in power, history, and relationship to the Galactic Civil War." Six of the larger governments and corporations spread across the galaxy have now signed up to the 'third way' encapsulated by the Second Treaty of Forsetti, making the Second Galactic Concordiate one of the largest organisations in galactic history. On Year 19, Day 331, while Forsetti was swallowed by celebration, the heads of state of the Galactic Concordiate met to renegotiate one of the galaxy's landmark treaties. In Year 14, several former members of the Imperial Union formed the Galactic Condordiate, becoming the single largest alliance of neutral governments in the war between the Galactic Empire and the Galactic Alliance. 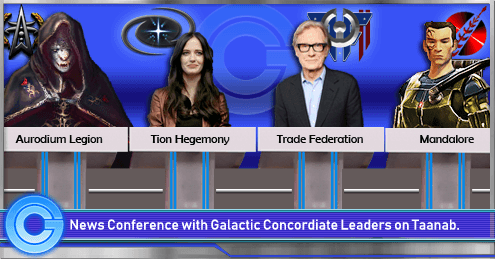 Four years on, and the leadership of the Concordiate has once more convened at the Trade Federation capital to renegotiate its founding document, the eponymous Treaty of Forsetti. "The galaxy has changed so much since we signed our first treaty." commented Lady Hegemon Stephanie Barefoot before the negotiations commenced, "The galactic civil war remains a pressing concern, but, new threats have emerged which treat the lawful-galaxy with contempt. And as the Executive Council meets on Taanab for a second time, we have agreed already that only by significant reform can we guarantee the peace and prosperity which has been the chief reward of membership in the Concordiate." The text of the Second Treaty of Forsetti has been released, and we're getting our first look at what exactly the heads of state saw the need to adapt. Among the most substantial changes are those concerning membership in the alliance and its governance. While the first treaty allowed both governments and private corporations to sign the treaty, only governments were permitted a seat at the Executive Council, by far the organization's most important body. By privileging the old guard in such a way as to stack the cards against newcomers, the issue of structure became a thorny one amongst the heads of state at each new accession hearing. New guidelines have flattened the hierarchy of the organization and opened up numerous areas to involvement by all members of the group. "The Galactic Concordiate began as a way to formalize the relationship between those governments which did not sign the revised treaty of the Imperial Union. As successful as this format has been, we have recognized its insular character for some time." explained Viceroy Jacob Jansen, "Beyond that, there are many territories across the galaxy where sovereignty does not rest with a government, but, instead we see many planets, systems, and even whole sectors governed by corporate rule. Often these areas are the only respite from pirates and gangs in their local area. By favoring official governments, we have inadvertently excluded many billions of sentients from the protections and prosperity which the Concordiate offers. We hope that with these changes we can open up our partnership to all those in our galaxy who believe that only through coming together, can we achieve the real benefits of peace." Viceroy Jansen addressed the alliance's position on accessing member technology, another key point of the revised treaty. "We want to make it clear that we are an alliance for everyone, from modest manufacturing firms to governments of all sizes, and regardless of technological capability. We provide a forum for cooperation, that's true, but the trade of technology is handled as a strictly bilateral affair. With the language we have in place in this new treaty, individual members have the assurance that as members of the alliance, their technology cannot be pressured from them." Significant changes were also made to the mutual defense agreement. Regent Nohv Schiller stated that "The first treaty had a somewhat impractical defensive agreement. Members were obligated to respond militarily to, potentially, anywhere in the galaxy in which an attack on the Concordiate had taken place. We have revised the treaty in this respect to allow for the organization to vote on military and non-military interventions, and for individual members to choose whether they wish to accede or not to these motions. The new treaty will therefore still allow for the most powerful members of the alliance to intervene in the defense of others with military force, where it is practical for them to do so. We think that these new provisions keep conflicts from escalating needlessly. Members are obviously encouraged to build diplomatic relations with other members, and defensive pacts, too, as they see fit." Perhaps the most surprising development to come out of the meeting was the news that the Hapes Consortium elected not to sign the revised treaty. Sources close to the Fountain Palace have said that the Consortium took advantage of this opportunity to reassess its position in the galaxy, and that it did not object to the treaty in principle. "On behalf of the people of the Consortium," said King Kadrim, "I would like to express our gratitude to all those who we have worked with during these years within the Galactic Concordiate to maintain the stability, peace and prosperity of our societies. I am confident the second Galactic Concordiate will find great success in expanding its horizons and boundaries well beyond what it has ever seen before, and I sincerely wish them all the best with their future endeavours." The King has vowed to retain Hapes' close relations with the "big four" original members. The Second Treaty of Forsetti represents an enormous shift in the diplomacy of the post-Imperial Union Concordiate. Rooted in the sovereignty of its members, the Second Concordiate expresses a vision for the rule of law and peaceful coexistence that is best expressed by the collective action of like-minded and independent states. By offering up an inclusive multilateral vision of neutral politics, a formerly insular defensive alliance has been reformed into a vehicle for neutral powers to seize the opportunity for creating an intergalactic order separate from the conflict-ridden priorities of the Imperial Union and the Galactic Alliance.